Find Florentius Baenius and recruit him into the Dawnguard. Reach stage 60 of Prophet. 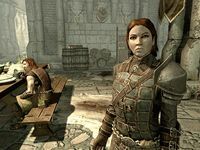 "Gunmar and I have been talking"
After recruiting Sorine Jurard and Gunmar into the Dawnguard during the quest A New Order, Isran will send you on a hunt for Dexion Evicus, a Moth priest traveling around Skyrim, starting the quest Prophet. During your search for the priest, you will find that vampires have taken Dexion hostage inside Forebears' Holdout. At that point in the quest (stage 60), Sorine and Gunmar will have settled down in Fort Dawnguard's western area, and while keeping up appearances, they have secretly discussed the vampire threat. Sorine will ask you directly: "Do you have a moment? Gunmar and I have been talking and, well, we're slightly worried. We both realized that if Isran's even allowed us in here, he must be really concerned. And if he's that concerned, the situation must be pretty bad. Make sense?" She then admits that she and Gunmar agreed that they could use the help of one 'Florentius', a former priest of Arkay and quite eccentric. The problem is Isran and Florentius have a past, and Isran obviously dislikes the priest. Another problem is that Isran is the only one who knows the location of Florentius, and she leaves it to you to get the information. This starts the quest and you will have to seek out Isran, although Sorine encourages you to keep her involvement a secret. When confronted with the request, Isran will immediately guess the persons responsible: "Who said something, Sorine or Gunmar? I thought they'd have learned their lesson by now. I don't trust that man, and I don't want him here." He then reckons the Dawnguard can use all the help they can get and will point you towards Ruunvald, an excavation site recently explored by Vigilants of Stendarr, including Florentius, with the comment: "If he can maintain some appearance of normalcy, I'll allow him to stay." The Ruunvald Excavation is located on the mountainside east of Shor's Stone and consists of a tent and what appears to be a mine entrance. Examine the tent for a journal, the personal observations of a Vigilant named Volk. The journal mentions that Volk and Florentius both had the tiresome job of guarding the entrance, until they were finally invited to join the dig by a Vigilant named Apa. Although the two guards were beginning to find the whole situation suspicious, they clearly ventured into the mines as ordered, and you will have to do the same. I am certain we are digging in the right place. I can feel it in my bones, and I dream of finding Ruunvald at night. Even in my waking hours, I can almost hear a reassuring voice telling me we are going the right way. Upon entering, you can hear digging noises from below, so head down the slope to the woodworks set up by the Vigilants and notice the person standing on the adjacent platform, without moving at all. As you get closer you will see an odd red fog covering his face, and when he notices you he will immediately attack and identify himself as a Charmed Vigilant. From the chamber behind you, another Vigilant will rush to his aid, so dispose of them both and examine the first chamber for a locked chest with minor loot and, on a crate next to the northern tunnel, Discovering Ruunvald, Vol. I, a detailed journal written by Moric Sidrey, the Vigilant who discovered the place. Proceed through the northern tunnel until you reach an intersection with a patrolling Vigilant and a booby-trapped oil slick. Use the oil to your advantage or pick the fight and beware of another Vigilant near the malachite vein to the northwest. Head down the southern tunnel and claim the contents of a minor loot chest. Proceed forward until you reach a large room with two Vigilants and a husky. Take them all down and examine the southwestern corner for several useful potions near a bed roll. In the center of the room, on a crate near another bed roll, sits Discovering Ruunvald, Vol. II with more of Moric Sidrey's detailed observations on the dig, along with some unsettling personal issues. It must have something to do with the cramped spaces, but I have found myself prone to aches in my head. While these hardly deter me from my leadership role, I have found myself distracted at times. I have had many a conversation with the workers where I drift off, only to have them call me back to reality. Sometimes I lose small amounts of time and can't remember what I've done. Locate the narrow tunnel to the east and proceed forward as it twists and turns. A locked chest can be found under the woodworks ahead, and, further down the tunnel, yet another Vigilant accompanied by a husky. A huge wooden scaffold leads down into the next chamber, obviously used by the hardworking Vigilants as storage, as several crates and barrels are stacked up, along with a bookshelf with common books. On the table near the shelf is volume III of the journal, detailing not only his own recurring headaches, but headaches among his crew of Vigilants as well. However, despite the pain and blackouts, the dig continued, even if Moric Sidrey's attention turned away from Ruunwald towards something else in the depths of the mine. I dream we'll finally reach Ruunvald, and I can't help but reflect on what this will mean to my reputation! My family will be so proud, especially my father, Minorne. He and mother have always been interested in my studies, even if my sister Minorne was not. But I'm most excited to reveal my findings to my colleagues, Minorne and Minorne, and perhaps my mentor Minorne. Oh, won't they all be pleased? 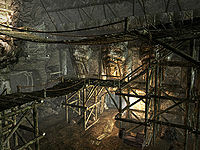 The next area contains more crates and barrels, along with three pressure plates triggering mounted crossbows, so dodge the plates and proceed through the northern tunnel into a huge chamber filled with Nordic architecture, a hanging bridge, and several Charmed Vigilants. After fighting your way over the bridge, one of the attackers will have a familiar name, specifically Volk, who initially guarded the entrance with Florentius but was charmed along with his colleagues. Before heading downstairs, examine the enclosed western room for a chest. At the bottom of the large chamber, examine the northeastern corner for an owned bed, a chest, and some food. This chamber also marks the spot where Moric and his crew finally broke through the right wall and found the entrance to Ruunvald Temple. However, the fourth and final volume of Moric Sidrey's journal, which can be found on a barrel near the entrance to the Temple, reveals that Moric and his workers were all led to the Temple by a strange voice that slowly seduced them all. I have found my muse and her name is Minorne. Reading back over old journals, I realize she has called to me from deep inside Ruunvald. She is the voice I've been hearing, the one who has called me ever downwards into the mountain. The Vigilants, the workers, they hear her too! What joy to learn that I am not alone in her love! Oh, Minorne, how would we have ever found this place without you! As expected, Ruunvald Temple is a typical Nordic ruin, although no draugr enemies can be found here. Proceed down the first hallway to a table holding the book Minorne, the ramblings of former Vigilant of Stendarr Moric Sidrey, and a love letter to his new mistress in the depths of the ruin, Minorne. It details his eternal love and how he managed to lure even more Vigilants into the ruin, simply by lying. It also contains a clue to the whereabouts on your target, Florentius Baenius, and his hatred towards anyone who would harm his mistress: "There are fools in this world that do not heed to her beautiful voice. The guard, Florentius, sent from the Beacon, he still prays to Arkay, an absentee god who pales in comparison to Minorne! I will pray to the goddess I can see! May he rot in his cage!" Proceed down the available path until you reach a large chamber, with stairs leading up to an altar and a cage, and three shadowy figures wandering around. 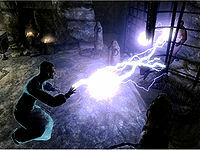 They turn out to be another Charmed Vigilant, Moric Sidrey himself, and his godly mistress Minorne, who is actually just an ordinary Altmer warlock, who is busy torturing the imprisoned Florentius for no apparent reason, using her leveled Destruction spells. All three will attack you on sight, so take them down and loot Minorne's corpse for the unique Staff of Ruunvald and the Ruunvald Key. "Isran? My help? Is this... some kind of a joke?" 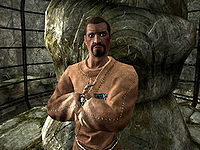 Inside the cage, Priest of Arkay Florentius Baenius will show little of the normalcy requested by Isran when he shows his gratitude: "I knew you had it in you! Arkay wasn't so sure. Between you and me, I think he didn't expect you to make it. But not me! I knew it all along!" He will then ask how he can repay you, so ask him to meet you at Fort Dawnguard and he will ask why. When you explain Isran needs his help he will be quite surprised: "Isran? My help? Is this... some kind of a joke? Did Arkay put you up to this? Isran's done nothing but mock me. He's never given me the respect I deserve." After you beg for his help, he will finally agree, but only due to strange voices in his head: "Look, I've just gotten myself out of quite a mess here, in case you haven't noticed, and while I appreciate your help, I... What's that? No, that's not what I... Yes, but... Are you sure? Really? Fine. Arkay says it's a good idea for me to go. I don't agree, but he's not the sort of fellow you can just ignore. I'll see you at Fort Dawnguard, then. Don't worry, Arkay will show me the way." He will then leave the ruin and the quest will finish. While Florentius takes the long way back through the mine, locate the southern door and unlock it with the key. It leads to the deceased warlock's private quarters and contains a boss-leveled chest, the quest-related book The Aetherium Wars, an alchemy lab, and a handle which reveals a hidden pathway back to Skyrim. Any Charmed Vigilants that are still alive when Minorne dies will also die instantly. Completing this quest unlocks the radiant quests Rescue and Lost Relic. See the quest articles for more information. This quest can be completed at any time, even after finishing the main quest line for the Dawnguard. Florentius may sometimes turn hostile and attack you, thus not letting you initiate conversation with him. Possible fixes include loading a previous save and waiting outside the cave for 24 hours before going back in, using a Pacify spell to calm him long enough to initiate conversation, or trying to initiate conversation when he is kneeling in recovery. The Dawnguard may try to kill you if you fail to rescue Florentius. ? If you have already completed Touching the Sky, talking to Isran will automatically trigger the start of Kindred Judgment. You will not be able to get information on Florentius. ? You can circumvent having to talk to Isran using the command setstage DLC1HunterBaseStage2 20. Note that Florentius is spawned during stage 10 of the quest, so you need to complete that first, or use setstage DLC1HunterBaseStage2 10. Don't skip straight to stage 20. 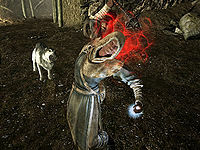 If you feed on charmed vigilants while in werewolf form, you will get a red aura around your head. The red aura will not leave you even if you change to human form, and will cause laggy graphics on weaker systems. 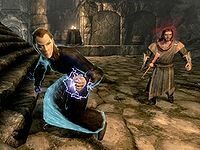 10 It's been suggested that the Dawnguard could use the help of a man named Florentius, a former Priest of Arkay. I need to speak with Isran to find out if he knows where Florentius might be. 20 I've been asked to find a man named Florentius in the hopes that he can assist the Dawnguard. 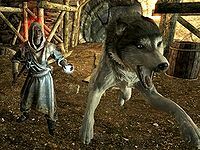 I've learned that he was last seen helping the Vigilants of Stendarr in Ruunvald. 200 Finishes quest I've rescued Florentius Baenius from Ruunvald, where he was being held captive. He's agreed to return to Fort Dawnguard and aid our cause. On the PC, it is possible to use the console to advance through the quest by entering setstage DLC1HunterBaseStage2 stage, where stage is the number of the stage you wish to complete. It is not possible to un-complete (i.e. go back) quest stages, but it is possible to clear all stages of the quest using resetquest DLC1HunterBaseStage2. This page was last modified on 8 June 2018, at 17:18.